Named for their toughness and indestructability, Spartan series chairs will be standing for a long time. Serving as a contemporary, yet extremely durable seating solution for your restaurant, diner, or bar, the Lancaster Table & Seating Spartan series features a collection of comfortable, sophisticated chairs that will instantly upgrade the look and feel of any foodservice operation. 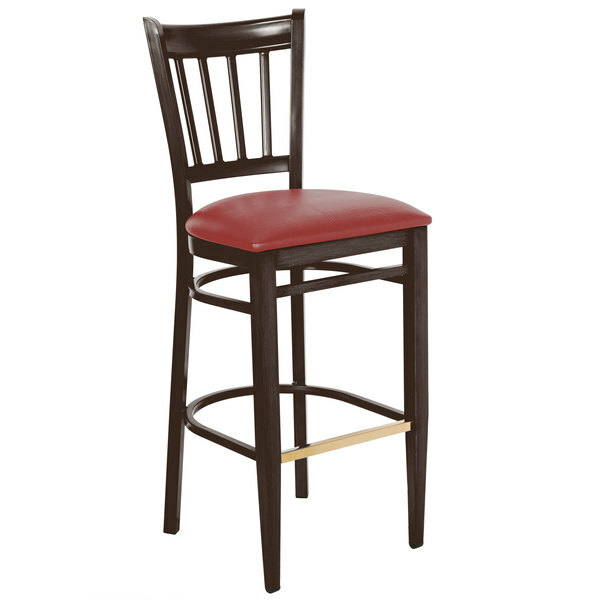 This bar height walnut wood grain slat back chair is fitted with a 2 1/2'' thick red vinyl seat for unparalleled comfort, while a unique metal frame boasts a classic wooden look. A slat back design, in addition to reinforced joints, adds extra support to the chair's back, and a 500 lb. capacity ensures the unit will accommodate all your guests. The frame's finish is resistant to stains, scratches, and smudges, while a plastic glide is placed on the bottom of each leg to protect your floors from scuffing. Plus, the heel bar features a protective gold plate to guard against wear and tear. The Spartan series represents the last chair you'll ever need to buy, thanks to a nearly indestructible design that's guaranteed to withstand years of high volume use. Choose to ship this item as assembled or knocked down. When the item is pre-assembled, it comes ready to use right out of the box! This saves significant time and labor during setup. Users can simply unpack it, place it in its desired location, and proceed to more important tasks. When the item is knocked down, it provides the best possible savings on shipping costs. Instructions are included for assembly upon unpacking. Please choose the state the equipment will be installed in so we can show you our closest vendors. Thanks, your message has been submitted! All Lancaster Table and Seating products offer durability, dependability, and unmatched value. We have the lowest prices, timeless style, and the versatility to keep you coming back for more.